Question: I was replacing my bathroom fan/light buttons but i could not replace them. I really need your help. As you can see in the picture that two wires(red and black) from top left pipe and 1 wire(orange) from right pipe and a blue wire is coming from the bottom. I don't know which wire is which and where to connect the wires to the buttons. Can you please explain me how to install light buttons for fan and light??? 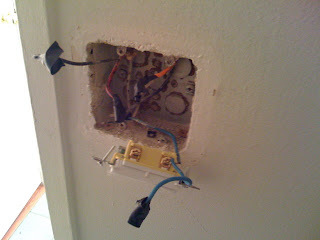 If this is something you don't know how to do it is not a bad idea to call in an electrician. Electricity is dangerous. It is not for every Do it yourselfer. It looks to me that the blue wire coming from below is your feed. That blue wire needs to go on the bottom of both your switches. The other wires get power when the switch is closed. They go on to the top of any one switch.